Timber Wolf pledges to the Legion as the shuttle flies away from Raal and the evil Dr. Londo. Timber Wolf worries he can't control the beast within but Saturn girl assures him now he's a Legionnaire he'll be safe with his new friends. Saturn Girl warns Brainiac 5 and Bouncing Boy to take it slow back to Legion headquarters as Wolf has never flown in deep space before. Help him stay calm. Of course, the warp drive fails and the ship shudders and clutters to a halt. Repairs underway Superman experiments with his x-ray vision and sees something heading for the ship - with lots of teeth, Brainy confirms a fleet of lunar leeches! Worse still the entire fleet is intent on feeding, steadily draining the power of the ship! Brainy uses his body and Lightning Lad's power to overload the ship and burn out all the leeches. As quickly as they overcome one obstacle then another arrives to test them... this time the gravitational pull of an asteroid field. Having drained all the ship's power to get rid of the leeches the ship's generators can't power up fast enough to save them - step in the power of Superman! Superman isn't quite graceful in the rescue attempt and shunts the crew into each other and the hull walls. Timber Wolf can't take the travel and they have to land on a nearby static asteroid so he can... bring up breakfast. Timber Wolf wonders how he is now able to breathe in space and fly around and Brainy gloats it's his invention - the Flight Ring! While Brainy then tends to ship repairs Saturn Girl scans the planetoid discovering a lunar leech survived! 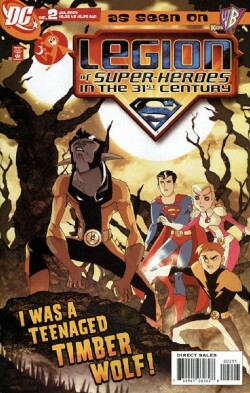 It promptly attacks the super-intelligent android and Lighting Lad and Superman are helpless to aid him - step in Timber Wolf! He's fed up with the Legion pussyfooting and unleashes his violent animal instinct. Destroying the leech, Wolf wonders if he's frightened his team mates. In fact it was the opposite, they were so impressed they consider him a fully-fledged Legionnaire! Story (prior to watching the episode) - 2: Another attempt to tell a non-story where nothing happens. It's really not good form to rely on people watching the series to enjoy the book. The fact that there really wasn't a story is worse! It's more like twenty-two pages of deleted scenes from the Timber Wolf episode. Art - 4: Nice artwork and much lighter inks this issue make it a nice slick issue visual wise. Cover Art - 3: Too much text and information hides a nice image. Shame, as it's a cool image.